This is Ocean Safety’s latest LED light version of their classic AQ40 incandescent bulb. 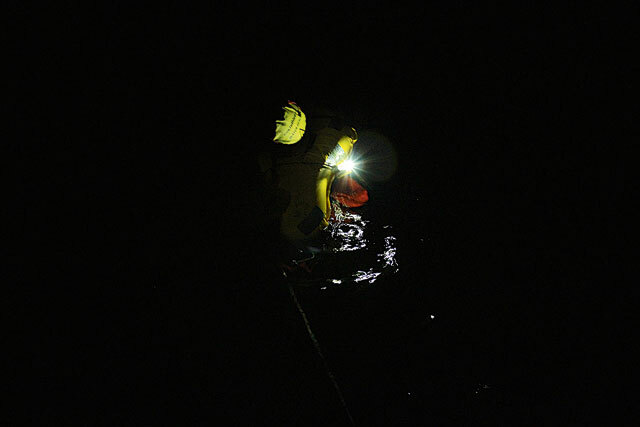 While not as bright as the cold-tinted Crewsaver light we tested, it was nonetheless highly visible. It has a ‘smoked’ plastic dome, giving close to 270° visibility and features a fairly long flash. It’s fixed via a very secure ‘saddle’ clip which attaches to the lifejacket’s light point, and is a sealed unit with battery inside, the water sensor being on a length of wire. On both our lifejackets its position wasn’t as prominent as that of the Crewsaver (inflation tube) or Spinlock (above the head). Nonetheless, it allows you to deploy the sprayhood and not be blinded by its flash.